For the 1851 treaty by the same name, see Treaty of Fort Laramie (1851). The Treaty of Fort Laramie (also the Sioux Treaty of 1868[b]) was an agreement between the United States and the Oglala, Miniconjou, and Brulé bands of Lakota people, Yanktonai Dakota and Arapaho Nation, following the failure of the first Fort Laramie treaty, signed in 1851. The treaty was divided into 17 articles. 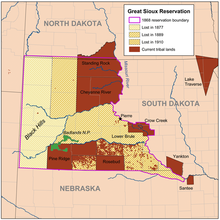 It established the Great Sioux Reservation including ownership of the Black Hills, and set aside additional lands as "unceded Indian territory" in areas of South Dakota, Wyoming, and Nebraska, and possibly Montana. [c] It established that the US government would hold authority to punish not only white settlers who committed crimes against the tribes, but also tribe members who committed crimes and who were to be delivered to the government rather than face charges in a tribal courts. It stipulated that the government would abandon forts along the Bozeman Trail, and included a number of provisions designed to encourage a transition to farming, and move the tribes "closer to the white man's way of life." The treaty protected specified rights of third parties not partaking in the negotiations, and effectively ended Red Cloud's War. It was negotiated by members of the government-appointed Indian Peace Commission, and signed between April and November 1868 at and near Fort Laramie in the Wyoming Territory, with the final signatories being Red Cloud himself and others who accompanied him. Animosities over the agreement arose quickly, with neither side fully honoring the terms. Open war again broke out in 1876, and the US government unilaterally annexed native land protected under the treaty in 1877. The treaty formed the basis of the 1980 Supreme Court case, United States v. Sioux Nation of Indians, in which the court ruled that tribal lands covered under the treaty had been taken illegally by the US government, and the tribe was owed compensation plus interest. As of 2018 this amounted to more than $1 billion. The Sioux have refused the payment, demanding instead the return of their land. Map 1. Some of the 1851 Fort Laramie territories. Later and at different times, each tribe would enter into new treaties with the US. The result was an often-changing patchwork of bigger and smaller parts of the initial allocations, newly established reservations, and former tribal land turned into new US territory. The bold outline shows the 1851 Sioux treaty area. The first Treaty of Fort Laramie, signed in 1851, attempted to resolve disputes between tribes and the US Government, as well as among tribes themselves, in the modern areas of Montana, Wyoming, Nebraska, and North and South Dakota. It set out that the tribes would make peace among one another, allow for certain outside access to their lands (for activities such as travelling, surveying, and the construction of some government outposts and roads), and that tribes would be responsible for wrongs committed by their people. In return, the US Government would offer protection to the tribes, and pay an annuity of $50,000 per year. The 1851 treaty had a number of shortcomings which contributed to the deterioration of relations, and subsequent violence over the next several years. From an inter-tribal view, the lack of any “enforcement provisions” protecting the 1851 boundaries proved a drawback for the Crow and the Arikara, Hidatsa and Mandan. :87 The federal government never kept its obligation to protect tribal resources and hunting grounds, and only made a single payment toward the annuity. Although the federal government operated via representative democracy, the tribes did so through consensus, and although local chiefs signed the treaty as representatives, they had limited power to control others who themselves had not consented to the terms. Finally, the discovery of gold in the west, and the construction of the Union Pacific Railroad, led to substantially increased travel through the area, largely outside the 1851 Sioux territory. This increasingly led to clashes between the tribes, settlers, and the US government, and eventually open war between the Sioux (and the Cheyenne and Arapaho refugees from the Sand Creek massacre in Colorado, 1864):168–70 and the whites in 1866. Map 3. By right of article I in the 1868 treaty, the US compensated the Pawnee with annuities owed the Sioux, after the Massacre Canyon battle in Nebraska on August 5, 1873. The Pawnee received $9,000. The government agreed that the agent for the Bureau of Indian Affairs shall keep his office open to complaints, which he will investigate and forward to the Commissioner. The decision of the Commissioner, subject to review by the Secretary of the Interior, "shall be binding on the parties". Article six laid out provisions for members of the tribes to take legal individual ownership of previously commonly held land, up to 320 acres (130 ha) for the heads of families, and 80 acres (32 ha) for any adult who was not the head of a family. :5 This land then "may be occupied and held in the exclusive possession of the person selecting it, and of his family, so long as he or they may continue to cultivate it." Article seven addressed education for those aged six to 16, in order, as the treaty states, to "insure the civilization of the Indians entering into this treaty". :5 The tribes agreed to compel both male and females to attend school, and the government agreed to provide a schoolhouse and teacher for every 30 students who could be made to attend. After 10 years the government may withdraw the individuals from article 13, but if so, will provide $10,000 annually "devoted to the education of said Indians ... as will best promote the education and moral improvement of said tribes." These are to be managed by a local Indian agent under the Commissioner of Indian Affairs. Article 10 provided for an allotment of clothes, and food, in addition to one "good American cow" and two oxen for each lodge or family who moved to the reservation. :5 It further provided for an annual payment over 30 years of $10 for each person who hunted, and $20 for those who farmed, to be used by the Secretary of the Interior for the "purchase of such articles as from time to time the condition and necessities of the Indians may indicate to be proper." The concept was clear enough to the commissioners … [who] well knew that hide hunters, with Sherman’s blessing, were already beginning the slaughter that would eventually drive the Indians to complete dependence on the government for their existence. The government agreed to furnish the tribes with a "physician, teachers, carpenter, miller, engineer, farmer, and blacksmiths". The government agreed to provide $100 in prizes for those who "in the judgment of the agent may grow the most valuable crops for the respective year." Once the promised buildings were constructed, the tribes agreed to regard the reservation as their "permanent home" and make "no permanent settlement elsewhere". The treaty, as agreed to "shall be construed as abrogating and annulling all treaties and agreements heretofore entered into." Notable signatories presented in the order they signed are as follows. Two exceptions are included. Henderson was a commissioner, but did not sign the treaty. Red Cloud was among the last to sign, but is listed here out-of-order along with the other Oglala. The treaty overall, and in comparison with the 1851 agreement, represented a departure from earlier considerations of tribal customs, and demonstrated instead the government's "more heavy-handed position with regard to tribal nations, and ... desire to assimilate the Sioux into American property arrangements and social customs." According to one source, "animosities over the treaty arose almost immediately" when a group of Miniconjou were informed they were no longer welcome to trade at Fort Laramie, being south of their newly established territory. This was notwithstanding that the treaty did not make any stipulation that the tribes could not travel outside their land, only that they would not permanently occupy outside land. The only travel expressly forbidden by the treaty was that of white settlers onto the reservation. The 1868 treaty would be modified three times by the US Congress between 1876 and 1889, each time taking more land originally granted, including unilaterally seizing the Black Hills in 1877. On June 30, 1980, the US Supreme Court ruled that the government had illegally taken land in the Black Hills granted by the 1868 treaty, by unlawfully abrogating article two of the agreement during negotiations in 1876, while failing to achieve the signatures of two-thirds the adult male population required to do so. It upheld an award of $15.5 million for the market value of the land in 1877, along with 103 years worth of interest at 5 percent, for an additional $105 million. The Lakota Sioux, however, have refused to accept payment and instead continue to demand the return of the territory from the United States. As of 24 August 2011[update] the Sioux interest on the money has compounded to over 1 billion dollars. Marking the 150th anniversary of the treaty, the South Dakota Legislature passed Senate Resolution 1, reaffirming the legitimacy of the treaty, and according to the original text, illustrating to the federal government that the Sioux are "still here" and are "seeking a future of forward-looking, positive relationships with full respect for the sovereign status of Native American nations confirmed by the treaty." On March 11, 2018, the Governor of Wyoming, Matt Mead signed a similar bill into law, calling on "the federal government to uphold its federal trust responsibilities," and calling for a permanent display of the original treaty, on file with the National Archives and Records Administration, in the Wyoming Legislature. ^ Iron Shell was the first to sign the document on April 29. Red Cloud and five others were the last on November 6. ^ See Battle of Honsinger Bluff and Battle of Pease Bottom. ^ In the case of the 1876 proposal to relinquish the territory of the Black Hills, the document was signed by only 10% of adult males. Congress none-the-less passed an act in 1877 enacting the terms. ^ Henderson is listed in the first paragraph of the treaty as a party, but unlike the remaining commissioners, his signature does not appear in the original document following the text of the treaty. Compare also this excerpt from the original document from the National Archives and Records Administration. According to one source, the previous November, both Sherman and Henderson were recalled to Washington D.C. "to attend urgent business." Around October, one source has Henderson in Washington attending to the impeachment proceedings of President Andrew Johnson. Although Sitting Bull was a member of the Hunkpapa Lakota, his signature is listed on the treaty itself under "the Ogallalla band of Sioux by the chiefs and headmen whose names are hereto subscribed". Whether this may be attributable to error on the part of those who crafted the treaty or those bearing witness and recording the signatures is unclear. ^ Red Cloud was among the last to sign the treaty, insisting he wait until the army had cleared forts along the Bozeman Trail as they had agreed to. He supposedly replied to attempts to bring him to the talks "We are on the mountains looking down on the soldiers and forts. When we see the soldiers moving away and the forts abandoned, then I will come down and talk. ":3 His arrival at the fort is variously reported as both November 4 and October 4,:3 although both agree he signed the treaty on November 6. ^ a b c d e f g h i j McChristian, Douglas C. (March 13, 2017). Fort Laramie: Military Bastion of the High Plains. University of Oklahoma Press. ISBN 9780806158594. Retrieved April 23, 2018. ^ a b c d Robinson, III, Charles M. (September 12, 2012). A Good Year to Die: The Story of the Great Sioux War. Random House Publishing Group. ISBN 9780307823373. Retrieved April 23, 2018. ^ a b c d e "Section 3: The Treaties of Fort Laramie, 1851 & 1868". North Dakota Studies, North Dakota State Government. Retrieved March 9, 2018. 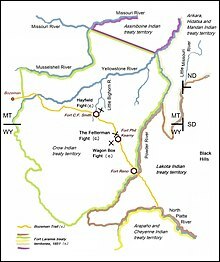 ^ a b c "Fort Laramie Treaty of 1851 (Horse Creek Treaty)" (PDF). National Park Service. Archived from the original on March 10, 2018. Retrieved June 11, 2018. ^ a b Gerrick, Mallory (1880). "The Dakota Winter Counts". Annual report of the Bureau of Ethnology to the Secretary of the Smithsonian Institution 4th 1882-1883. Smithsonian Institution, Bureau of American Ethnology. pp. 89–127. OCLC 855931398. Retrieved April 27, 2018. ^ a b c d e f g h i j k Kappler, Charles J. (1904). Indian Affairs. Laws and Treaties. Vol. 2. United States Government Publishing Office. OCLC 33039737. Retrieved April 24, 2018. ^ a b c d e f g h i Hoxie, Frederick E (1995). Parading Through History: The Making of the Crow Nation in America 1805-1935. Cambridge University Press. ISBN 9780521485227. Retrieved April 24, 2018. ^ a b c "Wyoming: Fort Laramie National Historic Site". National Park Service. Archived from the original on March 10, 2018. Retrieved March 9, 2018. ^ a b Stands In Timber, John; Liberty, Margot; Utley, Robert Marshall (1998). Cheyenne Memories. Yale University Press. ISBN 9780300073003. Retrieved April 24, 2018. ^ Kennedy, Michael (1961): The Assiniboine. Norman. ^ a b c d e f g h Meyer, Roy Willard (October 1, 1977). The village Indians of the upper Missouri: the Mandans, Hidatsas, and Arikaras. University of Nebraska Press. ISBN 9780803209138. Retrieved April 25, 2018. ^ a b Malouf, Carling Isaac (1963). Crow-Flies-High (32MZ1), a Historic Hidatsa Village in the Garrison Reservoir Area, North Dakota. United States Government Publishing Office. OCLC 911830143. Retrieved April 25, 2018. ^ a b Medicine Crow, Joseph (1992). From the Heart of the Crow Country: The Crow Indians' Own Stories. University of Nebraska Press. ISBN 080328263X. Retrieved April 25, 2018. ^ Schneider, Mary J.; Schneider, Carolyn (1987). The way to independence: memories of a Hidatsa Indian family, 1840-1920. Minnesota Historical Society Press. ISBN 9780873512183. Retrieved April 25, 2018. ^ Mallery, Garrick (1972). Picture-writing of the American Indians. Courier Corporation. ISBN 9780486228426. ^ Greene, Candace (May 4, 2015). "Verbal Meets Visual: Sitting Bull and the Representation of History". Ethnohistory. 62 (2): 217–40. doi:10.1215/00141801-2854291. Retrieved April 24, 2018. ^ a b c d McGinnis, Anthony (1990). Counting Coup and Cutting Horses: Intertribal Warfare on the Northern Plains, 1738-1889. Cordillera Press. ISBN 9780917895296. Retrieved April 25, 2018. ^ a b Allen, Charles Wesley; Red Cloud; Sam Deon (1997). Autobiography of Red Cloud: War Leader of the Oglalas. Montana Historical Society. ISBN 9780917298509. Retrieved April 25, 2018. ^ Serial 1220, 38th Congress, 2nd Session, Vol. 5, House Executive Document No. 1. ^ a b White, Richard (September 1978). "The Winning of the West: The Expansion of the Western Sioux in the Eighteenth and Nineteenth Centuries". The Journal of American History. 65 (2): 319. doi:10.2307/1894083. JSTOR 1894083. OCLC 6911158355. ^ Serial 1308, 40th Congress, 1st Session, Vol. 1, Senate Executive Document No. 13. ^ Ostlind, Emilene (November 8, 2014). "Red Cloud's War". Wyoming State Historical Society. Archived from the original on February 24, 2018. Retrieved March 9, 2018. ^ Ewers, John Canfield (1975). Intertribal Warfare as the Precursor of Indian-white Warfare on the Northern Great Plains. Western History Association. pp. 397–410. ASIN B0007C7DAQ. OCLC 41759776. Retrieved April 23, 2018. ^ Calloway, Colin G. (January 16, 2009). "The Inter-tribal Balance of Power on the Great Plains, 1760–1850". Journal of American Studies. 16 (01): 25. doi:10.1017/S0021875800009464. JSTOR 27554087. ^ Utley, Robert M.: “The Bozeman Trail before John Bozeman: A Busy Land.” Montana, the Magazine of Western History. Vo. 53 (Sommer 2003), No. 2, pp. 20-31. ^ a b c d Dunlay, Thomas W. (1982). Wolves for the Blue Soldiers: Indian Scouts and Auxiliaries With the United States Army, 1860-90. University of Nebraska Press. ISBN 9780803216587. Retrieved April 25, 2018. ^ a b Papers Relating to Talks and Councils Held with the Indians in Dakota and Montana Territories in the Years 1866-1869. United States Government Publishing Office. 1910. OCLC 11618252. Retrieved April 27, 2018. ^ a b "Sioux Treaty of 1868". National Archives and Records Administration. Retrieved March 8, 2018. ^ a b c d e f g h i j k l Hedren, Paul L. (1988). Fort Laramie and the Great Sioux War. University of Oklahoma Press. ISBN 9780806130491. Retrieved April 27, 2018. ^ a b c d e f g h i j k l m n o p q r s t u v w x y "Fort Laramie Treaty, 1868". Avalon Project. Retrieved March 9, 2018. ^ a b c d Viegas, Jennifer (2006). The Fort Laramie Treaty, 1868: A Primary Source Examination of the Treaty that Established a Sioux Reservation in the Black Hills of Dakota. The Rosen Publishing Group. ISBN 9781404204386. Retrieved April 27, 2018. ^ a b "A Bad Man is Hard to Find" (PDF). Harvard Law Review. 127. June 20, 2014. OCLC 5603885161. Retrieved March 15, 2018. ^ a b Blaine, Garland James; Blaine, Martha Royce (1977). "Pa-Re-Su A-Ri-Ra-Ke: The Hunters That Were Massacred" (PDF). Nebraska History. 58: 342–358. Retrieved April 27, 2018. ^ Standing Bear, Luther (1975) [First published 1928]. My People, the Sioux. University of Nebraska Press. ISBN 9780803293328. Retrieved April 25, 2018. ^ Standing Bear, Luther (November 1, 2006). Land of the Spotted Eagle. University of Nebraska Press. ISBN 9780803293335. Retrieved April 25, 2018. ^ Riley, Paul D. (1973). "The Battle of Massacre Canyon" (PDF). Nebraska History. 54: 220–249. Retrieved April 27, 2018. ^ a b Blaine, Martha Royce (1990). Pawnee Passage, 1870-1875. University of Oklahoma Press. ISBN 9780806123004. Retrieved April 25, 2018. ^ ”Indian Office Documents on Sioux-Pawnee Battle.” Nebraska History. Vol. 16 (1935), No. 3, pp. 147-155. ^ a b c Bell, Robert A. (2018). "The Fort Laramie Treaty of 1868 and the Sioux: Is the United States Honoring the Agreements it Made?". Indigenous Policy Journal. 28 (3). Retrieved March 9, 2018. ^ "A Century of Lawmaking for a New Nation: US Congressional Documents and Debates, 1774–1875 U. S. Serial Set, Number 4015". Library of Congress. United States Government Publishing Office. December 30, 1901. Retrieved April 25, 2018. ^ Howard, James Henri (1995) [Originally published: Washington: U.S. Govt. Print. Off., 1965]. The Ponca Tribe. University of Nebraska Press. ISBN 9780803272798. Retrieved April 27, 2018. ^ a b Report – United States, Bureau of Indian Affairs, Planning Support Group, Issue 267. United States Bureau of Indian Affairs. 1876. Retrieved March 9, 2018. ^ a b c d e f g h i j k l Oman, Kerry R. (2002). "The Beginning Of The End The Indian Peace Commission Of 1867~1868". Great Plains Quarterly. 2323. OCLC 864704686. Retrieved March 14, 2018. ^ a b "1868: Fort Laramie Treaty promises to provide health care, services". United States National Library of Medicine. Retrieved March 9, 2018. ^ Hollabaugh, Mark (June 2017). The Spirit and the Sky: Lakota Visions of the Cosmos. University of Nebraska Press. ISBN 9781496200402. Retrieved April 27, 2018. ^ a b Robertson, Francis B. (1984). ""We Are Going to Have a Big Sioux War": Colonel David S. Stanley's Yellowstone Expedition, 1872". Montana: The Magazine of Western History. 34 (4): 2–15. JSTOR 4518849. ^ a b Webb, George W. (1939). Chronological List Of Engagements Between The Regular Army Of The United States And Various Tribes Of Hostile Indians Which Occurred During The Years 1790 And 1898, Inclusive'. Wing Printing and Publishing Company. OCLC 654443885. Retrieved April 25, 2018. ^ Howe, George Frederick (December 1952). "Expedition to the Yellowstone River in 1873: Letters of a Young Cavalry Officer". The Mississippi Valley Historical Review. 39 (3): 519. doi:10.2307/1895008. JSTOR 1895008. ^ Annual Report of the Commissioner of Indian Affairs, 1873. United States Government Publishing Office. 1874. OCLC 232304708. Retrieved April 27, 2018. ^ "United States v. Sioux Nation of Indians, 448 US 371 (1980)". Justia. Retrieved March 15, 2018. ^ Lazarus, Edward (1999). Black Hills White Justice: The Sioux Nation Versus the United States, 1775 to the Present. University of Nebraska Press. ISBN 9780803279872. ^ Weist, Tom (1984): A History of the Cheyenne People. Billings. ^ Serial 4015, 56th Congress, 1st Session, pp. 824-825. ^ "Fort Laramie, 1868". Lakota County Times. Center for American Indian Research and Native Studies. May 4, 2017. Retrieved March 14, 2018. ^ Congressional Edition, Report No. 77, Claims of Sioux Tribe of Indians Before Court of Claims. United States Government Publishing Office. 1919. Retrieved April 27, 2018. ^ "150th Anniversary – Treaty of Fort Laramie Exhibition". Brinton Museum. Retrieved March 13, 2018. ^ "Sitting Bull". PBS, New Perspectives on the West. Retrieved October 1, 2018. ^ a b Matson, Laura (2017). "Treaties & Territory: Resource Struggles and the Legal Foundations of the US/American Indian Relationship". Open Rivers: Rethinking The Mississippi. University of Minnesota Libraries. Retrieved March 14, 2018. ^ a b Lubetkin, John M (2002). "The Forgotten Yellowstone Surveying Expeditions of 1871. W. Milnor Roberts and the Northern Pacific Railroad in Montana". Montana The Magazine of Western History. 52 (4). OCLC 367823756. Retrieved April 25, 2018. ^ Bent, George; Hyde, George E. (1968). Life of George Bent Written from His Letters. University of Oklahoma Press. ISBN 9780806115771. Retrieved April 25, 2018. ^ Linderman, Frank B. (1962). Plenty Coups. Chief of the Crows. University of Nebraska Press. ISBN 9780803280182. Retrieved April 25, 2018. ^ Medicine Crow, Joseph (1939). The Effects of European Culture Contacts Upon the Economic, Social, and Religious Life of the Crow Indians. University of Southern California. OCLC 42984003. Retrieved April 25, 2018. ^ Howard, James H. (1960). "Butterfly's Mandan Winter Count: 1833-1876". Ethnohistory. 7 (1): 28–43. doi:10.2307/480740. JSTOR 480740. ^ Kvasnicka, Robert M.; Viola, Herman J. (1979). The Commissioners of Indian Affairs, 1824-1977. University of Nebraska Press. ISBN 9780803227002. Retrieved April 27, 2018. ^ "Black Hills Expedition (1874)". Smithsonian Institution Archives. Retrieved March 9, 2018. ^ Frommer, Frederic (August 19, 2001). "Black Hills Are Beyond Price to Sioux". Los Angeles Times. Bellevue Community College. Archived from the original (Suggested Reading Black Elk Speaks and Articles Below) on November 11, 2014. Retrieved December 28, 2013. ^ Streshinsky, Maria (February 9, 2011). "Saying No to $1 Billion". The Atlantic. Retrieved April 27, 2018. ^ "S.D. Senate Passes Resolution Confirming South Dakota's Support for the 1868 Treaty of Fort Laramie". South Dakota Democratic Party. Retrieved March 14, 2018. ^ "Senate Resolution No. 1". State of South Dakota. Retrieved March 14, 2018. ^ "Wyoming Governor Signs 41 Bills into Law". KGAB. Retrieved March 15, 2018. ^ "SJ0002 – 150th Anniversary of the 1868 Treaty of Fort Laramie". Wyoming Legislature. Retrieved March 15, 2018. Harjo, Suzan Shown (2014). Nation to Nation: Treaties Between the United States and American Indian Nations. Nation to Nation. National Museum of the American Indian. p. 127. ISBN 9781588344786. Wikimedia Commons has media related to Treaty of Fort Laramie (1868). This page was last edited on 1 April 2019, at 21:09 (UTC).